"Jesuit and Feminist Education: Intersections in Teaching and Learning " by Elizabeth A. Petrino, Jocelyn M. Boryczka et al. Contributor: Jeffrey P. Von Arx, S.J. Jeffrey P. von Arx, S.J. is a contributing author, "Foreword". This book explores how the principles and practices of Ignatian pedagogy overlap and intersect with contemporary feminist theory in order to gain deeper insight into the complexities of today's multicultural educational contexts. Drawing on a method of inquiry that locates individual and collective standpoints in relation to social, political, and economic structures, this volume highlights points of convergence and divergence between Ignatian and feminist pedagogies to explore how educators might find strikingly similar methods that advocate common goals--including engaging with issues such as race, gender, diversity, and social justice. The contributors to this volume initiate a dynamic dialogue that will enliven our campuses for years to come.--Publisher description. von Arx, Jeffrey P. "Foreword" in Jesuit and Feminist Education: Intersections in Teaching and Learning in the Twenty-First Century, edited by Elizabeth A. Petrino and Jocelyn M. Boryczka. Fordham University Press 2012. Petrino, Elizabeth A.; Boryczka, Jocelyn M.; and von Arx, Jeffrey P. 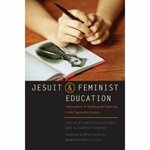 S.J., "Jesuit and Feminist Education: Intersections in Teaching and Learning in the Twenty-First Century" (2012). History Faculty Book Gallery. 2.